Scientists have collected a second burst of gravitational waves sweeping through the Earth. The warping of space-time was sensed on Christmas Day in the US at the Advanced LIGO laboratories - the same facilities that made the historic first detection in September last year. Back then, the waves came from two huge coalescing black holes. This new set of waves, likewise, is ascribed to a black hole merger - but a smaller one. Reporting the event in the journal Physical Review Letters, the international collaboration that operates LIGO says the two objects involved had masses that were 14 and eight times that of our Sun. The data indicates the union produced a single black hole of 21 solar masses, meaning they radiated pure energy to space equivalent to the mass of one star of Sun size. It is this energy, in the form of gravitational waves, that was sensed in the laser interferometers of the LIGO labs in Livingston, Louisiana, and Hanford, Washington State, at 22:38 Eastern Standard Time on 25 December (03:38 GMT, 26 Dec; Boxing Day in Europe). According to UK collaboration member Prof Bernard Schutz of Cardiff University, making a second detection proves the first was not just an isolated event, and that Advanced LIGO really does have the capability to open up a new cosmic realm to investigation. "It shows the first event wasn't just a fluke. It shows that the Universe is filled with black holes spiralling in together and merging and giving off these huge bursts of gravitational waves quite regularly. It's a violent Universe," he told BBC News. It has been one big celebration since scientists fulfilled their decades-long quest in September by detecting the warping of space generated from the merger of black holes 29 and 36 times our Sun's mass. Key LIGO pioneers have been lauded with prizes, and there are very short odds now on the achievement being crowned with a Nobel in October. 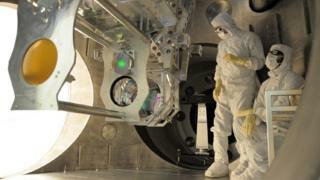 But the researchers involved say the effort was never about just the one detection; the dream has always been to use the routine observation of gravitational waves to learn new things about the cosmos. And that is apparent in the latest result. Because of their lighter mass, the Christmas Day black holes spent more time - about a second - in the sensitive band of the LIGO instruments. The data captures the last 27 revolutions the black holes make around each other. Theorists have always said black holes should spin, but this is very strong observational evidence for the phenomenon. "One of the black holes was spinning with the dimensionless number of 0.2," Prof Gabriela González from Louisiana State University, US, told reporters. "We measure between zero (not spinning) and one (maximally spinning). We can also measure the spin of the final black hole but we expect that black hole to have a spin (because of the merger); we don't know about the original black holes and that's astrophysical information that informs the scenarios for how black holes form." Media captionProf Sheila Rowan: "Relief and satisfaction at seeing the results come in"
Significantly for this detection, the new waves had an amplitude that was below the LIGO instruments' noise level, meaning sophisticated algorithms were required to pull out the signal. As with September's event, the Christmas Day merger occurred approximately 1.4 billion years ago, but little can be said about where exactly on the sky it happened. The LIGO detectors measured the waves 1.1 milliseconds apart, and comparing these arrival times provides some directional information. However, it is only when the labs start working with the Italian laser interferometer, Virgo, due to start operations later this year, to provide a third point of reference, that better triangulation will be achieved. The Autumn run of data-taking should also see improvements in sensitivity of 15-25%. "That may not sound like much but what's important to remember here is that sensitivity is a direct measurement of how far we can see a particular gravitational wave event," explained LIGO executive director, Prof David Reitze. "And since we increase the distance by which we see an event, we increase the volume by the cube of that number. So, even a modest improvement of 25% in sensitivity gives us a factor of two in event rate." Given that this initial search immediately threw up two black hole mergers, scientists will be confident of making even more detections in 2016 - and not just of inspiralling black holes. "There are other discovery targets out there that have always been on our list," said Prof Sheila Rowan from Glasgow University, uk. "Supernovae - seeing the gravitational signal of a supernova core collapse. It's got fabulous science embedded in there that will tell us about the mechanism - the actual mass collapsing at the centre of a star. "Pulsars - neutron stars rapidly spinning with a bump on their crust, tracing out a dent in space as they do so. That could carry information about the material from which neutron stars are made. We can't replicate that kind of matter here on Earth." The collaboration has a "candidate" event on 12 October, but there is insufficient confidence in the data to claim this as an unambiguous detection, says Prof Fulvio Ricci from the Sapienza University of Rome, Italy. "We don't flag it as a gravitational wave signal; we call it 'LVT', which means LIGO-Virgo Trigger. It's relatively significant. If we were to interpret it as an astrophysical signal, it is the signal coming from the merger of two stellar black holes." Wednesday's announcement comes a week after the European Space Agency said it was now feasible to fly a gravitational wave observatory in orbit. Its Lisa Pathfinder mission has been trialling technologies for laser measurement techniques that would work far from Earth. And the performances achieved in the demonstration have easily outstripped the expected requirements. Having an observatory in space would enable the detection of gravitational waves of different frequencies to those sensed on the ground, including the warping generated by mergers of truly gargantuan black holes - ones that are many millions, even billions, of times the mass of our Sun.